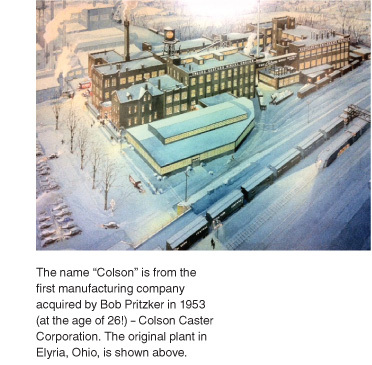 Colson Associates” roots go back to 1953 when Bob and Jay Pritzker purchased an ailing manufacturing company—The Colson Corporation—located in Elyria, Ohio. At that time, the company produced bicycles, wheelchairs, industrial casters and other metal products. As Bob began to turn the company around, both Jay and Bob also began to lay the groundwork for what would become one of the most successful and respected group of American manufacturing companies—The Marmon Group. When Bob Pritzker retired from The Marmon Group in 2002, he took a handful of caster, hardware and medical device companies and formed Colson Associates. After Bob passed away in 2011, because of Trust considerations, the caster and hardware businesses were sold. 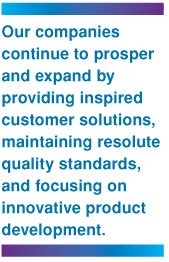 The Colson Associates’ Medical Companies were not affected by the sale and continue to operate and prosper as they had during Bob’s leadership. Operated and managed independently, the member companies are advised by a staff of experienced business executives at Colson Associates on accounting, international and state tax, finance, legal, real estate, acquisitions and other matters. Today, the employees of the Colson Associates member companies are guided by Bob’s ethics and business practices that he cherished and held in such high regard: always meet commitments and operate on sound business principles with the highest level of fairness, respect and honesty.